Contrary to some reports, learning to drive is still a right of passage for young people. The unenviable task of teaching teens behind the wheel usually falls on their parents, plus maybe some extra help from a driving instructor. However, the daughter of the President of the United States can't really expect dad to toss over the keys to The Beast and take a ride down Pennsylvania Avenue. 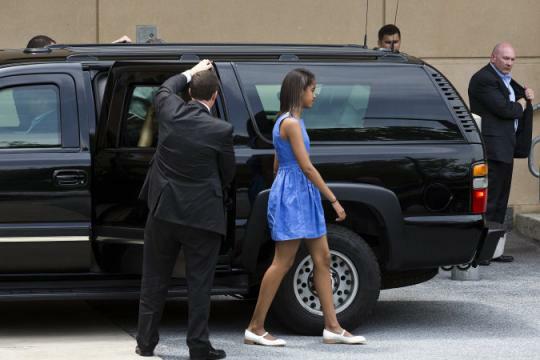 Instead, when it came time for Malia Obama to learn, she got driver's ed from the Secret Service. "They wouldn't let me in the car with her," Michelle Obama said about Malia's Secret Service instruction in an interview with Rachel Ray, according to CNN. Not letting the First Lady teach her daughter how to handle a car might have been for the best. Obama said that she has largely forgotten some of what to do behind the wheel during her time in the White House. Now licensed, Malia sometimes drives by herself, but obviously with a security detail nearby. The tricky balance of driving and national security is not an issue only for the Obamas. Vice President Joe Biden has complained about the Secret Service not letting him get behind the wheel of his 1967 Corvette.